"BASIL was a terrific person, just the salt of the earth, he'd do anything for anyone." These are the lasting memories a heartbroken family and mourning community will cherish after the tragic death of Raheen Stud's Basil Nolan Jnr. Tributes have flowed in from the community for the beloved father of four, who was killed in a farming accident late on Melbourne Cup day. Basil, 45, is remembered as a kind-natured and hard-working family man. He grew up at his family's property in Gladfield and learned to work and breed thoroughbreds from his father Basil Nolan Snr. 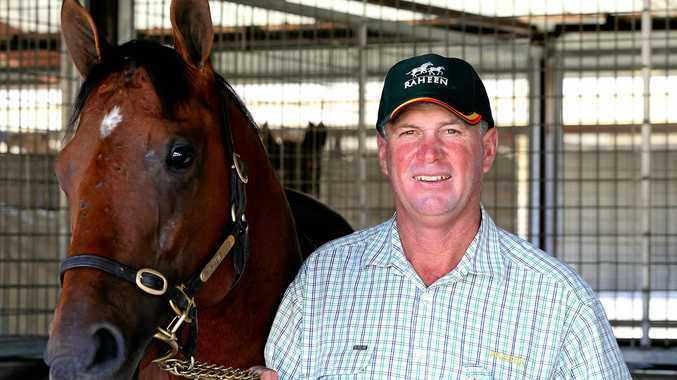 Melbourne Cup-winning trainer Peter Moody is a close family friend and said the Nolans were integral to his success. "My association with Basil and his brother Tim came through their mother and father, Basil Snr and Diane, and their stud Raheen," Mr Moody said. 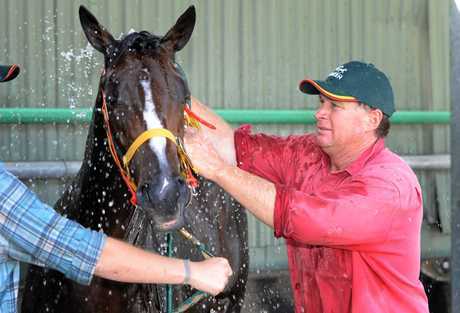 "As a young racehorse trainer in Queensland they were very supportive of me." 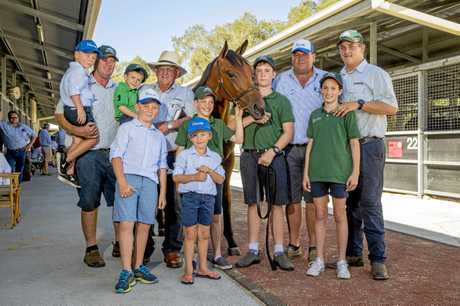 Mr Moody developed a firm friendship with Basil through conversations at yearling sales, breeders' meetings and by training the family's horses for the past 15 years. "I had a great respect for Basil, I had great respect for his knowledge and ability with horses. Young Bas was just a champion fella," he said. "He was a gentle soul, he was always very serious about his horses and about his business, but he always had time to sit down and have a chat." Their most recent meet-up was at Flemington during Derby Day. "He came up to me and we had a yarn, it was great to see him." Through the years, Mr Moody grew to rely on Basil in the tough times. 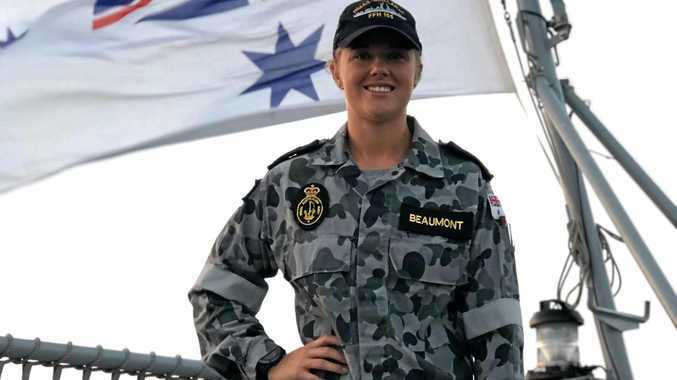 "When I ran into trouble three years ago, I got into the car and went for a drive for a few weeks and the first thing I did was drive from Melbourne to Raheen," Mr Moody said. He arrived in the small hours of the morning and didn't want to wake anyone, so Mr Moody rolled out a swag out the front of Basil's house and went to sleep. Later that morning he was woken by young Basil and the Raheen staff. "Young Bas was poking me with a rake stick because he didn't know who was in the swag, saying, 'Oi, Oi, Oi, wake up, you shouldn't be here,'" Mr Moody said. "Then I pulled my head out of the swag and smiled. "He dragged me inside, fed and bathed me and took me to the races that afternoon. "Basil was a terrific person, just the salt of the earth. He'd do anything for anyone. "I'm very appreciative of the time I had with young Bas and he was taken too early." This sentiment was echoed by Phil Grant from Warwick Turf Club. "Basil was - deadset - a top bloke," he said. "He was definitely a pillar in the racing community and I think in a few years he would have really put his mark on the wider community." About three years ago, Basil Jnr, his wife Natalie and their mates floated the idea of the StMary's Race Day as a fundraiser for the primary school. Mr Grant said what started as a simple idea developed into one of the biggest race days of the year thanks to Basil's dedication to the community and his forthright attitude to getting the job done. "At the start we were having a chat about who we could get to sponsor the main race. Bas said, 'Leave it with me.' 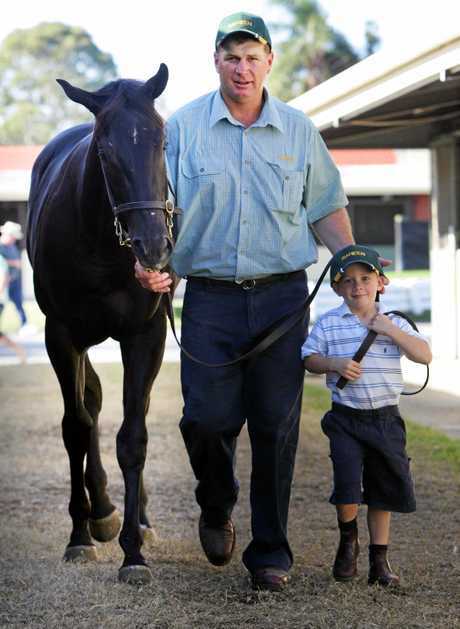 He walked outside and the next minute we had the Magic Millions as the sponsor," he said. "Basil seemed to know the right people. He was a very likeable bloke, he'd be the sort of fella you would want to have a beer with. "He was very easy to get along with but very straight down the line with what he wanted." Basil was also known for his love of footy, having represented his high school Nudgee College as a young man. He also played A-grade footy for the Warwick Cowboys. Acting Cowboys president Dayne Barrett shared the field with Basil on more than one occasion. "He would have racked up nine to 10 years with Cowboys," Mr Barrett said. "Basil was one of the best front rowers in the competition. He was a fair player and very skilful off-loader." Mr Barrett said Basil had plans to join the club's management committee in the near future and his untimely passing had been felt by all the members and players. "He was a stalwart of the club, everyone is in shock," MrBarrett said. Still, he is grateful for the time they had together. "There were a few times when we had some lean years, but we didn't lose many games by a lot of points." Basil is survived by his wife Natalie and children Basil, Lilly, James and William; brother and sisters Jane, Sally, Theresa, Timothy and Majella; and his parents Basil Snr and Diane.